If you are displaying posts based on a hashtag, it's possible that certain users will "hijack" your hashtag on the social network and consistently post inappropriate content. To complete the setup, if posts from the unwanted users are currently appearing in your live feed, click "Save your filters" and then click "Yes, apply to existing posts". 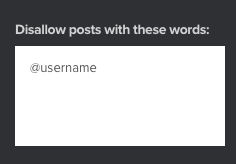 This will move the unwanted posts over to your "Moderated Posts" section. If no posts from those users are currently in your live feed, click "Save your filters" and then click "No, only future posts". Remember, you can also turn on the "Send all posts to moderation" feature, if you wish to manually review all posts before they appear in your feed.